Turnstone in Gorleston-on-Sea, near Great Yarmouth, Norfolk sleeps 6 people. Turnstone near Great Yarmouth is a Victorian end-terrace property in the quintessential seaside town of Gorleston-on-Sea on the Norfolk coast. It is perfect for families, and there is a cosy living room, a separate dining room, a kitchen and a superb sun room for those cooler days. Upstairs is an east-facing twin bedroom along with a bunk room leading to the master bedroom with king-size bed. 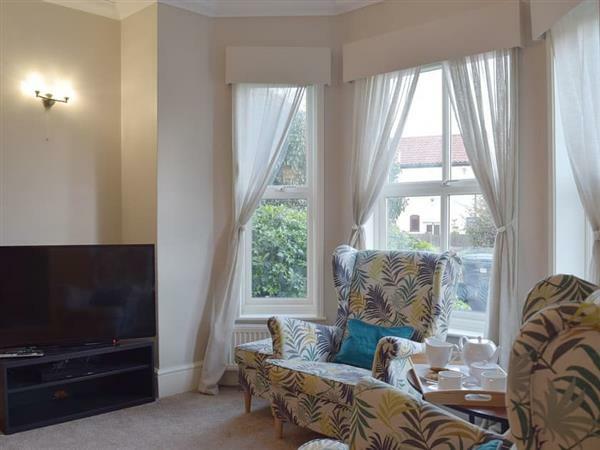 This is an ideal base from which to enjoy all the area has to offer including Gorleston beach, a stunning stretch of sand below a grand promenade and gardens. There’s also a yacht pond, manicured lawns, bowling greens, tennis courts, beachside cafés and a children’s playground. Throughout the summer, visitors can enjoy surfing, windsurfing and body boarding. The towns of Lowestoft and Great Yarmouth are close by along with the Norfolk coast, and Suffolk is also within easy reach. The Norfolk Broads National Park is equally a must see. You will find the beach, shop, pub and restaurant all 100 yards from Turnstone near Great Yarmouth. Living room: With 44’’ Freeview TV and DVD player. Bedroom 1: With king-size bed (accessed via bedroom 3). Gas central heating, gas, electricity, bed linen, towels and Wi-Fi included. Welcome pack. Enclosed garden with sitting-out area and garden furniture. 1 small dog welcome. Private parking for 2 cars. No smoking. Holidays at Turnstone run from Friday to Friday. For a better idea of where Turnstone is, you can see Turnstone on the map below. Turnstone is in Norfolk; should you be on the lookout for a special offer, you can find all the special offers in Norfolk. It's always worth checking to see what is on offer at the moment. Do you want to holiday near Turnstone (UK10298), you can see other cottages within 25 miles of Turnstone; have a look to find your perfect holiday location.